Where once there was a dam, today tourists are enjoying the newest interpretive attraction at Olympic National Park, about the world’s biggest-ever dam-removal experiment. Lupine fix nitrogen from the air in their roots and leaves, and are helping to nourish the ground, said Josh Chenoweth, restoration botanist for the park. 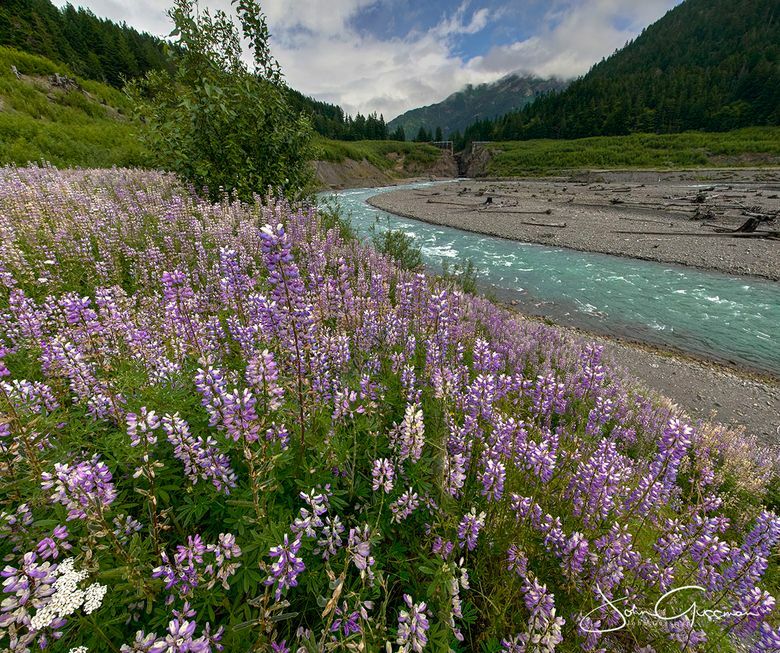 Raised from seed gathered in the Dungeness River valley, the lupine was sowed for the first time in 2013, and has flourished ever since. It is providing just the wind break, shade and food other plants need. “It’s been really important, and instead of hindering other plants this very aggressive species has really helped. It’s pretty spectacular,” Chenoweth said. Trees growing nearby are noticeably lusher since the lupine kicked into gear, he noted. This is the last year of the revegetation program for the Elwha, which has resulted in forests grown more than 20 feet high with more than 1,000 stems per acre of willow, alder and cottonwood on the valley walls — better and faster than anyone expected. Cobble, sand and gravel valley bottoms are another story, where the dry, poorly drained areas have more bare ground. In all, more than 320,000 plants, mostly trees and shrubs, have been planted along with 6,000 pounds of seeds to revegetate the former Lake Aldwell above the Elwha Dam and Lake Mills above Glines Canyon Dam. Meanwhile, blasting in 2015 and 2016 has helped fish make it higher than ever in the watershed. Contractors for the National Park Service, which is in charge of the $325 million federal restoration project, blasted rocks at both former dam sites to remove 14 boulders weighing 100 tons or more — two were as tall as a two-story building, and weighed more than 1,000 tons. The U.S. Army Corps of Engineers in 2016 also removed from the river channel metal and other debris left over from dam removal that had posed a hazard to boaters. More metal removal is planned for this summer. 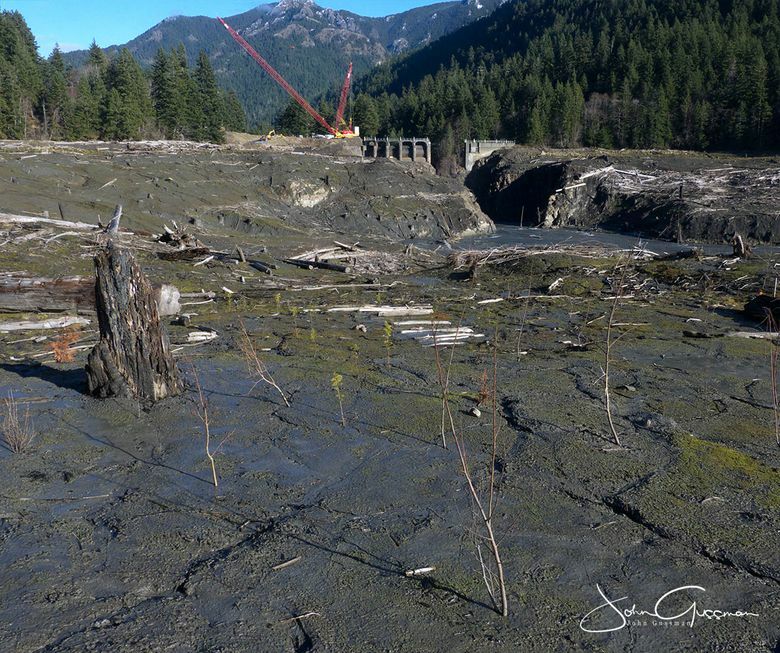 While the Elwha has been roaring back to life ever since the first dam came down, there is still a long way to go. “We’ll be another 20 years down the road before we meet fish restoration,” said Doug Morrill, natural-resources director for the Lower Elwha Klallam tribe. “We are seeing progress. But we are in the early stages.” The fishing moratorium imposed on the Elwha was recently extended by state, federal and tribal fish managers for another two years, until June 1, 2019. The overall return of adult fish to the Elwha is actually down since dam removal began. That is because the fish coming back now went to sea as juveniles during the time of highest sediment loading in the river, just after dam removal. By now the river is back to normal clarity. Fish continue to take on more of the 70 miles of spawning habitat returned to them with dam removal, noted Mike McHenry, habitat biologist for the tribe. 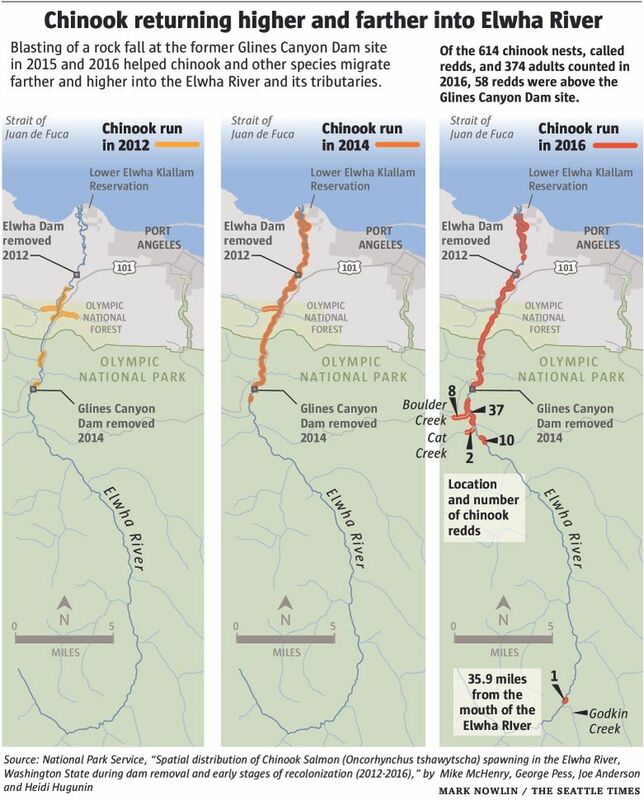 Last fall, a single chinook salmon redd was spotted some 36 miles upriver near Godkin Creek. That’s 23 miles upstream of the former Glines Canyon Dam, and the highest up in the watershed since the dam came down. More than 100 chinook redds were seen above Glines last year, the most ever. Coho also were observed spawning in Cat and Boulder creeks in 2016 for the first time. One of the most dramatic transformations still underway is the beach that has been building at the river mouth, made of the sediment transported by the Elwha, finally free of the hydropower dams first built in 1910.